In what feels like the most relevant Versace Men’s collection in recent memory, Donatella Versace debuted Versace Active, a performance line, during the Spring/Summer 17 Men’s runway show. The collection was filled with thigh-clinching shorts paired with sheer body conscious knitwear and floor length outwear. 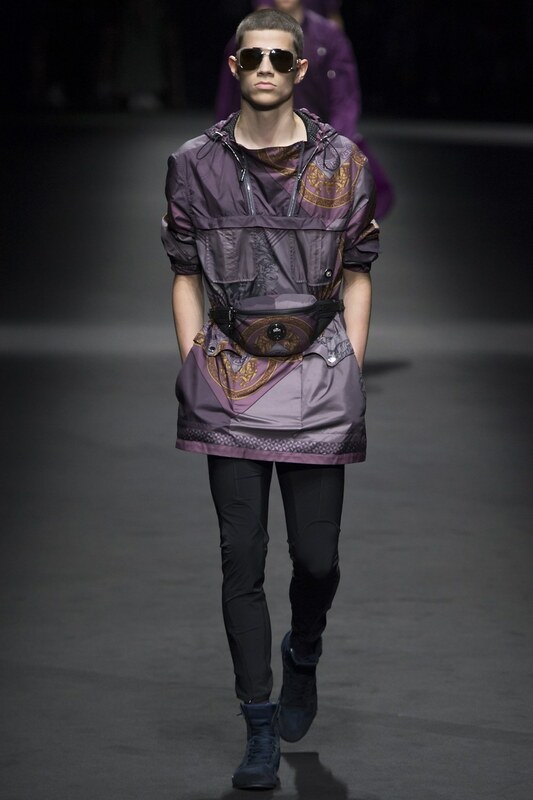 Black athletic tights and parkas bearing purple signature Versace baroque prints and the ever-present Medusa was face first on a purple print fanny pack (which I’m dying for!). A favorite was the billowing flesh-tone silk floor-length parka and matching athletic pants that, by today’s standard, could easily transition from day to night. I have personally held a firm stance against active wear as acceptable attire but through the eyes of Signora Versace, I could definitely see myself sporting a few of these looks.